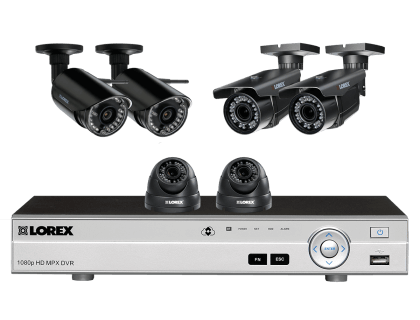 Learn about the Lorex Home Security System with 4 Wired and 2 Wireless Cameras for your surveillance needs. Includes features, pricing, & FAQs. The Lorex Home Security System with 4 Wired and 2 Wireless Cameras features 1080p HD image resolution, 3x optical zoom, and audio recording. This Lorex security camera system supports up to 8 cameras. 4 wired and 2 wireless HD security cameras. Pros: Easy setup, close-up and large area monitoring, remote Cloud access. Cons: Night vision not as good as day time vision. Bottomline: A complete surveillance system with SignalGuard technology for a more stable connection. What are some alternatives to the Lorex Home Security System with 4 Wired and 2 Wireless Cameras? Where can I buy the Lorex Home Security System with 4 Wired and 2 Wireless Cameras? The Lorex Home Security System with 4 Wired and 2 Wireless Cameras is available via Amazon and the Lorex website. Does the Lorex Home Security System with 4 Wired and 2 Wireless Cameras work at night? Yes, both the wireless and the wired MPX security cameras contain high-powered LEDs that allow you to see up to 170 ft. away. Can the Lorex Home Security System with 4 Wired and 2 Wireless Cameras be used in any weather? All MPX cameras included in this system are rated IP66 weatherproof and function in temperatures ranging from -22°F to 140°F.